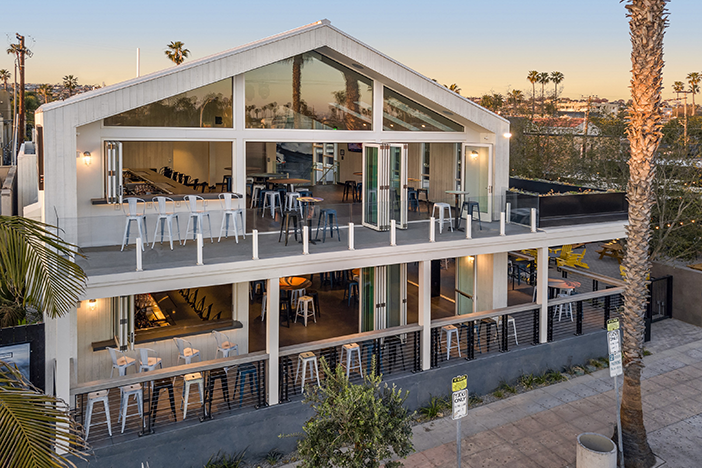 Enjoy beer, bites and games at the 15,000 square-foot Mavericks Beach Club. The heat is on in America’s Finest City this summer, when our great outdoors become downright magnificent. We rounded up 10 of our favorite ways to maximize all the county has to offer—a mix of both brand-new and tried-and-true experiences and destinations. As it turns out, San Diego makes for a delightful playground. By Sarah Daoust, adapted from Where San Diego magazine. Nothing beats a night at the movies…under the stars. The Arts District Liberty Station returns with its free outdoor film series, taking place the second Saturday of each month through October. Movies begin just after sunset on the lawn of Liberty Station’s north promenade. Screenings include Wonder Woman on July 14; Loving Vincent on Aug. 11; and a Wrinkle in Time on Sept. 8. Curated short films will precede each feature movie, along with surprise pop-up performances and activities throughout the evening. Bring a blanket and a low-back chair, and pack a picnic. Outdoor moviegoing reaches new heights with the San Diego debut of Rooftop Cinema Club, which presents movie screenings several nights a week throughout the summer atop the Manchester Grand Hyatt downtown. Take in views of the city and enjoy a luxurious outdoor cinema experience—including a state-of-the-art projector and provided headphones, deck chairs and blankets. Movies range from classics such as Casablanca to campy hits such as Grease to newer releases such as The Greatest Showman. Ticket prices start at $17 for a single deck-chair; $20 for a single deck-chair along with bottomless popcorn; and $24 (per person) for a double loveseat for couples and bottomless popcorn. Guests can also purchase gourmet street food, wine, cocktails and craft beer at the rooftop’s concession stand. Doors open at 6:30 p.m. and movies begin at 7:30 p.m. See website for summer movie lineup. Dine under the stars at Lionfish’s new rooftop. San Diego has no shortage of alfresco dining experiences, but a new downtown option has caught our eye. 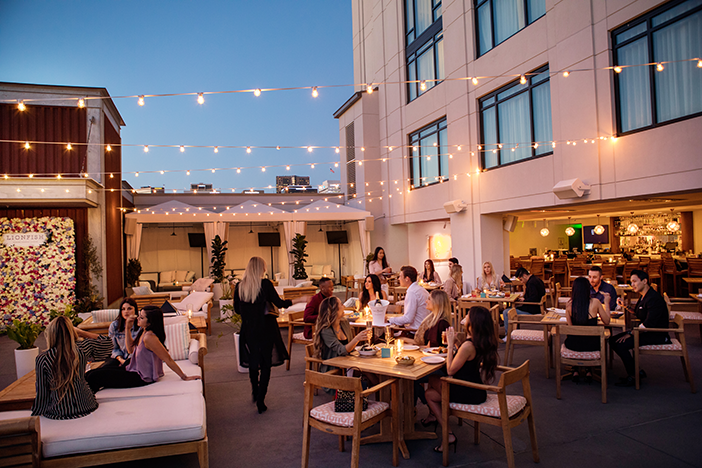 Lionfish, the luxe Pendry San Diego hotel’s signature restaurant, has expanded its dinner service up to its rooftop. Take in sweeping city and sunset views, then dine under the stars and twinkling lights on the pool deck—a portion of which has been converted to elegant outdoor dining space. Known for its modern coastal cuisine dreamt up by Executive Chef Jojo Ruiz, Lionfish serves up plates such as tajin-seared albacore, spicy grilled octopus, sushi rolls, daily fresh catches and mains such as maple-leaf duck breast. Pacific Beach is your quintessential beach ‘hood where summer is eternal. In the heart of the action, Mavericks Beach Club has opened in the former PB Bar and Grill space. And it’s a stunner. Enjoy cocktails, beer, bites and sunshine at the sprawling club, which spans two levels and 15,000 square feet. The indoor/outdoor venue features five bars, communal tables, a fireplace, outdoor games and TVs to catch the game. At night, Mavericks transforms into a dance club with live entertainment. Nearby in Pacific Beach, Waterbar is technically an indoor restaurant. Yet, it truly brings the great outdoors inside with its unparalleled views and the 6,700 square feet of prime oceanfront real estate. Spend the morning sunbathing, swimming and surfing; then head merely a few steps away for replenishments. The spacious hangout (formerly Joe’s Crab Shack) features panoramic views, craft cocktails, seafood dishes and sandwiches. Don’t miss the island tuna poke, the lobster roll and the seabass entree with smoked tomato broth and corn dumplings. Then head back out for round two of beach time. Head outside to get your workout in with Spin & Go. Get the fitness benefits of a challenging spin class, but with a breath of fresh air. 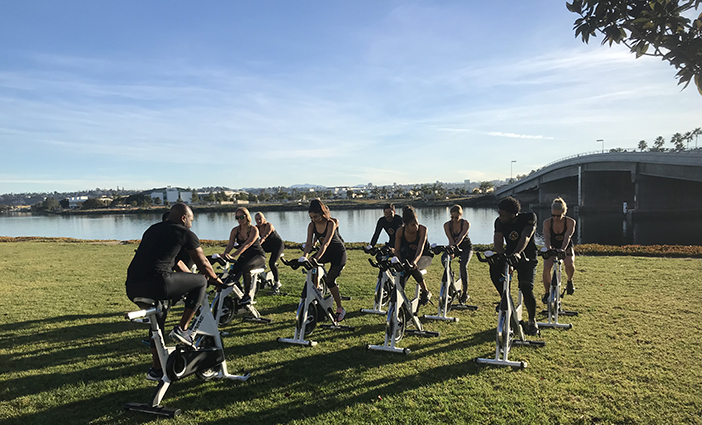 Coined as the outdoor evolution of indoor cycling studios, Spin & Go is the first company to offer outdoor spin classes in San Diego. Try an outdoor class at Liberty Station (held every Wednesday) for $20 for one ride; or $99 for six rides; with more classes to be offered at local beaches this summer. Future locations include Balboa Park, Kate Sessions Park and North County. The company also offers mobile “spin ups” to companies interested in corporate team-building—you get to pick the location. See the Bard’s works outdoors at the Summer Shakespeare Festival. A special San Diego summer tradition: Shakespeare under the stars in Balboa Park, courtesy of The Old Globe. 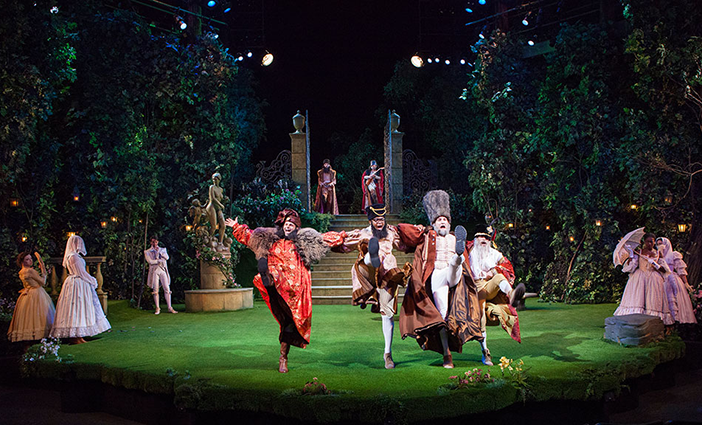 The theater’s annual Summer Shakespeare Festival never disappoints, with a mix of the Bard’s comedies, histories and tragedies played out on the Lowell Davies Festival Theatre outdoor stage after sundown. In the lineup this summer: the enchanting fantasy The Tempest, June 17-July 22; and the comedy Much Ado About Nothing, directly by three-time Tony Award winner Kathleen Marshall, Aug. 12-Sept. 16. Thrill seekers will be stoked to find this new surprise at SeaWorld this summer—the Electric Eel, the San Diego park’s tallest, fastest roller coaster. A fusion of loops, twists and inversions, the brand-new roller coaster reaches a nearly 150-foot ascent and speeds of 62 miles per hour. And a fun fact: The one-minute ride promises a very rare, upside-down view of Mission Bay. For more thrills, soar quietly and effortlessly like a bird over San Diego with Sky Sailing. The Warner Springs-based, family-owned flight school and sightseeing operation offers sailplane and glider rides and tours for one or two passengers; plus, rentals and instruction. Fly with knowledgeable, safe pilots (who showcase their skills at the Miramar Air Show, slated this year for Sept. 28-30), as you take in unmatched views of Lake Henshaw, Palomar Mountain and the Palomar Observatory. Sip on a signature latte under the sunshine at Communal Coffee. Combine a coffee break with family time and a chill session at the new Communal Coffee outpost in South Park. The charming outdoor cafe and community gathering space by owner Jen Byard is a 2,000 square-foot oasis that feels like a bohemian garden, flanked by a restored 1959 Shasta trailer. 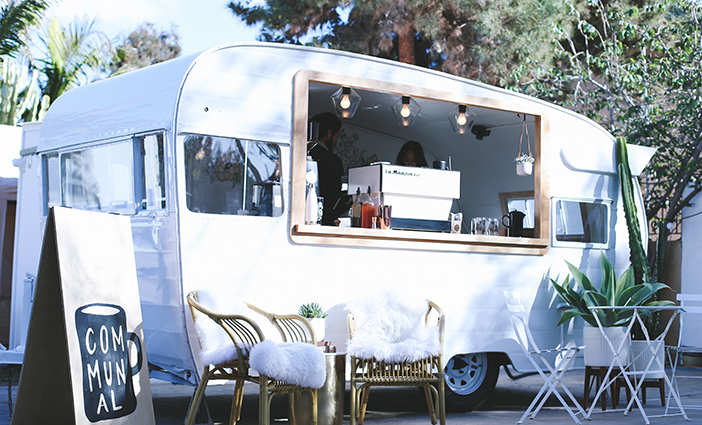 Inside the trailer, a custom La Marzocco espresso machine brews up signature lattes and coffee drinks; plus house-made sparkling lavender lemonade, light bites and more. Back outside, comfy seating, plants and florals abound; along with a retail component offering housewares and fresh flowers. Summertime in San Diego isn’t complete without a surfing adventure. Whether you’re a novice or just a bit rusty, lessons are a good idea. One of our favorites to help is Ocean Beach Surf School. Offering both private and group surf lessons, summer surf camps for kids and after-school programs (along with stand-up paddle-boarding lessons), the company has something for everyone. You can also rent a surfboard, wetsuit or paddleboard by the hour or day. And you can’t beat the iconic location. Surfing in “OB” is the stuff of California dreams. Lionfish photo by Becca Batista. Summer Shakespeare Festival photo by Jim Cox.